Is is my understanding that my grandfather, M. M. Brockway, invented the bus lift and donated it to public domain in the early to mid fifties. Here is the only known Crown Coach picture so far of his invention. To millions of California children, going to school means riding in a Crown Supercoach, and to a substantial number of western firefighters, doing their jobs involves the use of a Crown Firecoach. Beginning on page 12, Jim Valentine unfolds the story of Crown Coach Corporation, the builder of unique lines of these specialty vehicles. Crown Coach finally closed in 1991, but its recent acquisition by another school bus firm may mean a longer life for its products. Carriage and wagon builder Don M. Brockway established Crown Carriage Company in central Los Angeles in 1904. Formed to build truck cabs and bodies, the firm soon had a line of standardized bodies. The first bus body was built in 1915, constructed mainly of wood, on a Federal truck chassis, and in 1917 the first enclosed school bus bodies were made. Both these school bus bodies and enclosed tour and intercity bus bodies rapidly became popular. A larger facility and greater capital were required, so the firm incorporated and built a large plant to the east of downtown Los Angeles at McPherson (now 12th) Street and Santa Fe Avenue. It opened in November 1923. Crown formed an aircraft division in 1925, building as many as three biplanes per week, which were called the Crown Model B-3, but which were actually a Kinner Airster built under license. The aircraft division was discontinued with the onset of the depression. The first school bus with dual rear wheels was built in 1927 on a Reo chassis. The body structure was mostly wood, but used metal outer panels and side roll curtains. The firm began building larger school bus bodies on Mack chassis, using steel framing, which carried 43 students. In 1930, the curtains were replaced with drop-sash metal framed windows. Crown built its first complete bus in 1932, an integrally-constructed, all-metal bodied bus with safety glass side windows. It was rectangular in appearance, its style resembling the early Twin Coach buses. The cost of such units was high for the depression era, so in 1935 Crown again brought out some school bus bodies on commercial truck chassis. These were called Metropolitans, or Metros, and had simple envelope bodies on a commercial chassis, probably provided by Moreland. The same year a larger, integral design was introduced, more streamlined than the 1932 style, known as the Crown Supercoach. It had air brakes, and carried either 67 high school or 76 elementary students. Two over night sleeper buses with underfloor engines were built in 1936. This led to the first underfloor-powered school bus in 1937, with seating increased to 79 students, the largest school bus to that time. The engine was moved to the rear in 1940, with altered bodywork allowing two emergency exits and greater headroom. For 1947, the school buses changed back to underfloor engines. In 1950 some body contours were altered to a more rounded shape having added strength, and resulting appearance remaining almost unchanged, except for window sizes, for forty years. Crown’s first fire truck was a pumper built in 1949, which was used as a demonstrator until production was begun by a newly formed division in 1951. The firm offered only a line of Hall-Scott-powered pumpers at first, soon labelled Crown Firecoach. Their durability and huge brakes made them popular in mountainous areas. A line of larger custom equipment was added later, including ladder trucks, telescoping aerials, and combination ladder-water tower units. These came on 4×2 or 6×4 chassis, with hydraulic outriggers for stability. Fire truck production ended in 1981, except for a few cab-and-chassis units provided to another builder. About 880 Crown Firecoaches appear to have been built. The first bus with a diesel engine was built in 1954. The following year, a school bus was offered which could carry 91 students, Crown’s first with tandem rear axles. Crown began producing a bus-truck hybrid the same year, which had tandem axles and an underfloor engine. It used a bus body with seating for twenty passengers, and had a twenty-foot cargo area behind, with rear loading doors. Shorter but similar units were produced with a single rear axle and provision for twelve passengers. Crown was also building highway post office trucks for use by postal contractors. Single- and tandem-axle versions, in 35- and 40-foot lengths, respectively, were built. These had the usual Crown front grafted onto a rectangular body. Another odd truck was a Crown Cargo Coach, with the bus front on a Trailmobile trailer body using a 6×4 Crown chassis. During the 1960s and 1970s Crown provided an assortment of studio, library, and medical trucks, and even heavy-duty wreckers. After the 1950 structural changes, Crown offered a variety of intercity and sightseeing coaches using modern slanted side windows. Some had a raised main deck to allow greater baggage capacity underneath. There were available in 32-, 35-, or 40-foot lengths, some with tandem rear axles, carrying from 33 to 57 passengers. Most had underfloor engines, but rear engine placement was available on the longest units. Crown’s last intercity coach order was filled in 1980. Crown Security Coaches were also produced from the early 1950s on, using barred windows. These jail buses came in 35- or 40-foot lengths, and carried from 42 to 64 prisoners, depending on interior style. Fleets as large as 50 existed, and many are still in daily use, though 25 to 30 years old. Other engines offered after the introduction of diesels, besides the Hall-Scotts, were the underfloor Cummins, and Detroit inlines and Detroit V8s for some rear engine applications. Fire equipment offered Cummins, Detroit, Ford, or International engines. Once Hall-Scott had ceased production, the most common cause for the retirement of a Crown product became the lack of engine parts. Caterpillar, Cummins, or Detroit diesels were available in Crown’s recent years, with additional models of each available for non-California customers. In the early postwar years, Crown was a distributor for the small Ford transit buses, and was a dealer for the Texas-built Coachette city buses in the 1961-62 era. The firm became regional distributors for the attractive Quebec-built Prevost intercity coaches in 1969, an arrangement which they discontinued in 1983. Crown did not build integral transit buses until recently. In 1979 an agreement was struck between Crown and Ikarus Coach and Vehicle Works, of Budapest, Hungary, for Crown to build and market articulated transit buses in the US. Hungarian technology and bodies were used with local interiors and running gear. Crown did find customers for these units, and 243 Crown-Ikarus 286 buses were assembled between 1981 and 1986. They were 102 inches wide and 60 feet long, the largest Crowns ever built. They had three well-spaced axle positions, with the flexible body joint behind the second axle. Several Cummins underfloor diesels were available, and seating arrangements ranged from 61 to 76 passengers, plus 37 standees. Crown went through various name changes until the Brockway family sold Crown Coach Corporation to the newly-formed Crown Coach International in 1980. The new firm purchased a factory thirty miles to the east in Chino, California, in 1984, moving most assembly work there. The Lost Angeles plant was used as well, until it was sold at the end of 1986. The firm was passed into receivership, and the plant, equipment, and stock were sold at auction, on April 23, 1987, to GE Railcar Services, a unit of the General Electric Company. A new subsidiary, Crown Coach, Incorporated, was formed, and the plant reopened in July. The 1989 Crown school bus lineup included 35-, 38-, and 40-foot lengths, carrying from 78 to 90 students. Axle layouts were 4×2, 6×2, 6×4, and a 40-foot bus could be built on a 4×2 chassis. Both mid-engine and rear-engine positions were available, with three-fourths of sales being the underfloor version. Manual transmissions were offered, but three-fourths of sales used Allison automatics. Leaf springs on air-ride suspension were offered. Most buses were sold with retarders to augment the braking system. Frame rails and crossmembers were built from nested channel steel, welded together. Double-walled steel bodies were welded to outriggers on the main chassis rails, a basic construction technique unaltered since 1950. Windshields were a choice of two-piece curved or four-piece flat glass. A 90-passenger 6×4 with manual transmission weighed about 25,000 pounds empty. These buses were guaranteed for twenty years or 150,000 miles, and cost from $90,000 to $135,000. 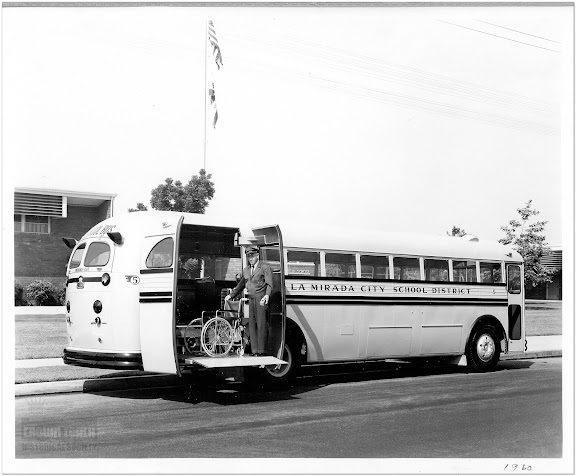 Production capacity of the Chino plant was fifteen buses per week, but actual production was often less than that. This was offset by building rear-engined running chassis for a motor home builder, and a small transit bus manufacturer. Crown built a methanol-fueled demonstrator school bus which was on the road in early 1989, using a version of the Detroit 6V92, the only California-legal methanol engine. This vee-layout engine was too wide to fit in the rear position of a standard Crown 4×2 bus structure, so they designed a new, flatter rear end-cap for the body which allowed space to reposition the engine mounting. A matching front end-cap was produced, resulting in the first noticeable change to the school bus appearance in forty years. At least ten of these units were sold, and by 1990 some conventionally-powered buses used the new style as well. Demand was low for the durable and large Crown school buses, designed to the requirements of the western states only. Replacement needs were minimal, due to the durability of existing, older Crowns, which structurally met more recent safety requirements. Most fleets were buying the smaller, lighter, cheaper units produced elsewhere in the special “western” versions which met the local smog, noise, and lighting requirements. General Electric found the operation unprofitable, and, after unsuccessfully seeking a buyer during 1990, closed the factory doors on March 31st, 1991. On May 21st, their machinery and equipment was sold at auction. This may not have been the last gasp of the Crown Coach, for Carpenter Body Works, Inc., of Mitchell, Indiana, purchased most of the assets, including the machine tools and the Crown name. Carpenter, also a school bus manufacturer, was, according to a report in the Winter 1991-92 Bus World Magazine, intending to produce Crown’s rear-engine chassis with their own bodies. Apparently, reintroduction of Crown’s large integral-body school bus was under consideration, as was work on a new Supercoach, a fiberglass-fronted design on which Crown Coach was working when operations ceased. Crown bus production appears to have averaged perhaps 100 units a year in the early postwar years, increasing to possibly 150 by the early 1960s. Their peak production was during recent years, with from 350 to 500 units per year between 1975 and 1985. Fire trucks, Crown-Ikarus transit buses, and chassis for other builders are not included in these estimates. When you think about calamities in California, depending on your age, you might think of Gov. Arnold Schwarzenegger’s declaration of a budget crisis, the Hells Angels rampages of the 1960s, or perhaps ABC Sports’ Al Michaels yelling, “We’re having an earthquake!” from the broadcast booth at Candlestick Park during the 1989 World Series between the San Francisco Giants and the Oakland A’s. Most people savvy about emergency management in California, however, would probably first think fondly of the unique custom fire apparatus built by Crown Coach Corp. of Los Angeles, which, due in no small part to its exposure through television and movies, remained America’s most immediately recognizable brand of fire truck for decades. Crown was founded as a carriage- and wagon-maker in 1904, but began building buses by 1915. The largest segment of Crown’s market over the next several decades was school buses, with engines either amidships or mounted in the rear. Since the school bus business tended to be seasonal, Crown executives decided to adapt the midship-engine chassis for firefighting use, and call the resulting vehicle the Firecoach. The very first Crown Firecoach triple-combination pumper, with an open cab, was delivered to West Covina, California, and followed a technical formula that would be repeated hundreds of times henceforth: power from a gasoline-fueled, 935-cu.in. Hall-Scott straight-six engine, manual transmission, and a 1,250-gpm centrifugal pump. Most sales were to departments in Southern California, and for years, Crown apparatus made up almost the entire fleet of the Los Angeles City and Los Angeles County fire departments, the region’s largest. An open-cab Firecoach served as the original Engine 51 on the 1970s TV hit, Emergency! But other Crowns found homes in locales as distant as New Jersey, Hawaii and even Kuwait. All could be spotted at once by their rounded, forward-leaning cab fronts and vertically stacked headlamps and fog-lamps. The only major running changes made to Firecoaches during their history was the widespread adoption of diesel engines and automatic transmissions, and the introduction of a widebody cab in 1977. By that time, Crown’s school bus sales had trailed off considerably and the Firecoach market was no longer large enough to be profitable. Crown attempted an alliance with FMC Corp., which owns Van Pelt, another California fire-truck manufacturer, but the effort failed and the final Crown-Van Pelt pumper was delivered to Santa Monica, California, in 1985. Today, the distinctive “devil wind fire wagons” still live in the hands of the Crown Firecoach Enthusiasts (www.crownfirecoachenthusiasts.org), a chapter of the Society for the Preservation and Appreciation of Antique Motor Fire Apparatus in America (SPAAMFA) whose members own some 80 Crowns. One of the more unusual rigs is this 1976 Firecoach tractor-drawn aerial owned by Mike McDonald. Tillered aerials were seldom produced by Crown, which generally sold either midship- or rear-mounted ladders on three-axle chassis, or Snorkel and Squirt booms in a variety of lengths. McDonald’s rig is a rare bicoastal hybrid: Its 100-foot aerial ladder was produced by Maxim Motors of Middleboro, Massachusetts, another regional builder that folded around the same time as Crown. This ladder truck originally served San Diego. This article originally appeared in the MAY 1, 2006 issue of Hemmings Motor News.